An online IAAF World Half Marathon Championships round-up report can be found here, with much more to be included in this week’s AW magazine. Amelia Pettitt replicated Georgina Schwiening’s success from last year’s Isle of Man Easter Running Festival with three comprehensive victories at this year’s event, while Cambridge University’s Oliver Fox and Leeds Doss runner Phil Sesemann also picked up victories. 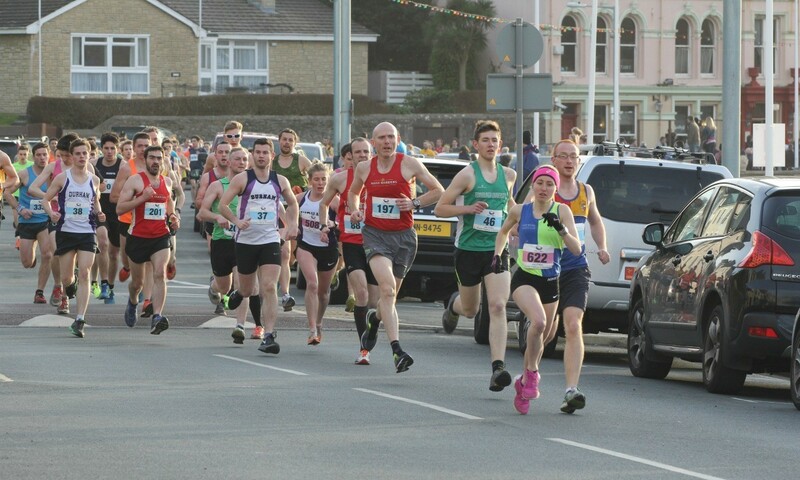 The three-day event included a 10km road race, fell run up Peel Hill – three miles for the women, four miles for the men – and a final 5km run for women and 4x5km road relay in the men’s competition. The weekend saw 1070 entries from more than 550 individual runners. Pettitt and Sesemann kicked off proceedings with wins in the 10km run on Good Friday. Sesemann – joined by Fox, fellow Leeds teammate John Ashcroft, Cambridge’s Alex Milne and Edinburgh Unviersity’s Mike Christoforou – was at the front of the field throughout, and kicked past Ashcroft in the final 300m, demonstrating his superior track speed to take the victory. Pettitt, 20, competing for Vale Royal AC, was unchallenged throughout as she joined groups of male runners on the inland roads before finding herself in a sprint for the finish alongside her boyfriend. In the Full Factory Winnerswear Peel Hill run Fox improved on his fourth placed finish from Friday with a commanding win on the rain-soaked course while Pettitt continued her dominance with a win ahead of Manchester University Alehouse runner Hannah Brown by 41 seconds despite a fall early on. The Newcastle University student cruised to her third comfortable win of the weekend along the seafront in Douglas in the Outback 5km on Easter Sunday to kick off the final day’s running. Leeds Doss AC took the overall victory ahead of Manchester University Alehouse and Vale Royal in second and third respectively, while Pettitt won the individual competition ahead of Manchester’s Brown and Durham’s Jenny Walsh. In the men’s road relay Ashcroft produced the second quickest individual leg of the race for Leeds Doss to pull back a 20-second gap from the Cambridge leaders before Sesemann held off Edinburgh’s Ben Stevenson on a tiring anchor leg to take the win for Leeds ahead of the Scottish team. In the individual standings Fox, the GB junior international, won in the men’s individual standings after a consistent set of performances while Christoforou came second and fellow Edinburgh runner Scott Stirling in third. A full report and picture of the event will appear in this week’s AW magazine. James Skelton (32:42) won the men’s race while world masters W40 800m and 1500m champion Louise Rudd won the women’s race in 36:41. Phil Wicks won the men’s race in 50:26 while his wife Emily won the women’s race in 59:13. William Mycroft won the men’s race in 31:00 while Hannah Oldroyd won the women’s race in 36:45. Photographs of the event from Steve Bateson will appear in this week’s magazine. Geremew Tadele won the men’s race by two minutes in 30:41 while his wife Justina Heslop made it a family double with a 36:01 victory. Max Law threw 62.97m with the 600g javelin on his 2016 opener, the 13-year-old improving from his previous best of 56.80m with the implement. That mark puts him fourth on the UK under-15 all-time list. There were world leads for Shayla Sanders at 100m (11.13) and by Jaide Stepter at 400m with a 50.91. The 2009 world 800m champion Caster Semanya won her event easily with a solo 2:00.23. Paul Navesey of Crawley AC claimed the British 100km ultra distance crown with a time of 6:58:52. Daniel Weston, Wrexham, took the silver medal with a PB of 7:11:47 and Rob Turner, Edinburgh AC, took third in 7:17:11. Spa Striders’ Melissa Venables took the women’s title with 8:15:54. The silver medal went to Edwina Sutton, Centurion Ultra Team in 8.24.05 with Sophie Mullins from Fife AC in 8.30.22 ensuring the hosts were also represented on the podium. In the 50km championship, Scotland’s Commonwealth games marathon runner Ross Houston of Central ran a Scottish 50km road record of 2:56:37. In the women’s event, Hannah Oldroyd of Saltaire Striders took the gold in 3:36:33.